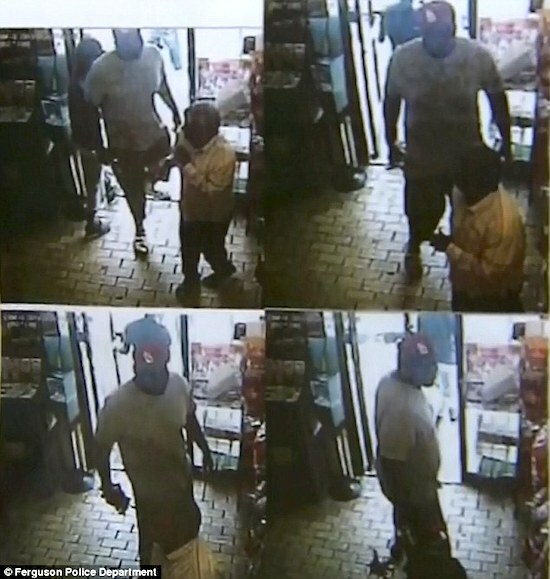 A major development today in the Michael Brown case: the Ferguson Police Department has released files, including surveillance video stills, indicating that Michael Brown and his companion, Dorian Johnson, had robbed a convenience store just ten minutes before Brown’s altercation with officer Darren Wilson. Of course, questions about the encounter between Wilson and Brown remain, but this information sheds important light on the context of the encounter, which until now had been rather mysterious. PAUL ADDS: According to a report I heard on the radio, the local civil rights community is complaining about the release of the video documenting Brown’s criminality. The criminality doesn’t excuse the shooting that occurred thereafter, but that doesn’t mean it shouldn’t be made known. As usual, though, the message of the grievance industry is don’t muddy up our narrative with facts. JOHN adds: There are several ways in which the robbery may be relevant, but it is impossible to tell since the facts of the altercation are still unknown. The fact that Brown was fleeing the scene of a robbery and assault may tend to corroborate the police officer’s description of his conduct. It may explain otherwise puzzling behavior on Brown’s part, e.g., if the officer describes him as acting aggressively. Likewise, the fact that Brown’s friend is a robber is relevant to his credibility, if his account differs from that of the officer. Most fundamentally, of course, the fact that Brown was a robber who assaulted a store clerk sheds light on his character, which will be relevant to any assessment of conflicting accounts of what happened. The surveillance video also shows that Brown was a huge guy–6′ 4″ and over 300 pounds, reportedly–which is also likely to be relevant to the decisions faced by the officer Wilson. Whether the officer’s shooting of Brown was or was not justified is, at this point, unknown, but as more facts are made public, the fact that Brown had committed a robbery and assault just minutes earlier will surely be a pertinent part of the story.